(Newser) – As expected, the EU today made it official: It is going after Google, which was today hit with the first formal antitrust charges it's ever faced, the Wall Street Journal reports. 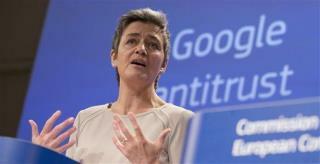 EU regulators also opened a probe into its Android mobile system. Regulators allege that since 2008, Google has steered Internet users away from competitors and toward its own "comparison shopping service," says EU Competition Commissioner Margrethe Vestager. What's at stake: a whole lot of time and money. The AP reports "years of legal wrangling" could follow, though the Journal reports a final EU decision could come as soon as late 2015, after Google has had the opportunity to respond to the "statement of objections." The EU can impose fines equal to 10% of annual revenue—that's $6 billion in Google's case. The EU went after Microsoft and won. Now they go after Google. In the US these companies are allowed to do whatever they want. I'm surprised that Barney never sued them for stealing his last name.